The Cuyahoga river, aside from having an awesome name, spent a century as one of the most horribly polluted rivers in the world. How polluted. The river has caught fire. Fortunately no fish were harmed in this fire, mostly because fish hadn’t been able to survive in the Cuyahoga for decades by the time the first careless match caused the WATER to BURN back in 1868. Now, one would think that rendering an entire body of water, a substance typically used to put OUT fires, capable of holding a flame would be a wakeup call for nearby industry. And it was… after a while. After thirteen times, to be exact. I’ll say that again. The Cuyahoga river caught fire not once, not twice, but THIRTEEN TIMES! What were they thinking after it happened for the twelfth time? “Meh, we’ll stop dumping effluent into it once it hits a baker’s dozen.” On the plus side, lucky number thirteen caught the eye of Time Magazine, thus starting the environmental movement. Plus, it probably looked pretty awesome at night. When people think of nuclear power, before long, they think of Chernobyl. It is as close to a worst case scenario as we are likely to see, as far as nuclear reactors are concerned. You see, nuclear power plants always need to be cooled, because the reactor generates heat constantly… that’s pretty much what radioactive MEANS. (Actually, it means constantly emitting subatomic particles, which in turn causes heat, but let’s not split hairs.) So a power plant needs power to run the coolant pumps even when it isn’t generating power. Since the plant is usually providing the power to begin with, getting the power to run the pumps is kind of an issue. Chernobyl had diesel generators, but they take a minute to spin up, so something had to be found to fill in that one minute power gap. Thus they decided to test if the spin-down of the recently shut down generator would work. Only they didn’t tell anybody else in the plant that they were doing it. A perfect storm of stupidity, bad timing, poor design, and just plain bad luck resulted in an explosion that spread four hundred times more radioactive material than the first A-Bomb. More than four thousand people died, more than 350,000 people had to be relocated, a huge swath of the landscape was irradiated, and depressingly few super heroes were created. I realize that technically this would invalidate the first two items on this list, but, hey, you try making a list of environmental disasters if you can only count everything we’ve ever done as one. Fair and proper, yes. Good for rhetorical purposes? No. The name may not sound familiar, but I assure you, you know what this is. It is more commonly known as “The thing that killed all of the dinosaurs.” Why do people always forget that this is an ecological disaster? Estimates place the total number of species that went extinct at around 75%. Not 75% of all of one species, 75% of species. If there were 4 kinds of bird before, there was one kind after, basically. Throw in the fact that most of the species that died out were the really cool ones, like the aforementioned dinosaurs, and it becomes clear that when it comes to doing major damage to the biosphere, BP ain’t got nothing on an asteroid impact. It makes the oily pelicans look positively bush league by comparison. Speaking of massive planetary impacts, “The Big Splash” dwarfed even the dinosaur killer in terms of raw, ecological destruction. 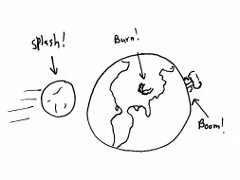 For the uninitiated, The Big Splash is the term scientists have applied to the impact between proto-earth and a planet called Orpheus. The asteroid that took out the thunder lizards caused a mini-ice age. This sucker liquefied the earth’s crust and sent a big ball of accumulated debris into orbit. This particular event only deserves a place on the list if proto-earth had an ecology at the time, but considering one showed up even AFTER we got smacked into by Mars’ angry evil twin, I’d say the odds are pretty good there was at least some plant life at the time of impact. And it sure didn’t stick around afterward. On the bright side, though, this lead to the creation of earth’s moon out of the dislodged debris, so without the Big Splash, tides, months, and werewolves wouldn’t be possible. Continuing the unimaginative naming schemes favored by scientists, we have number one on our list, The Big Bang. Like number 2, this is just a theory, but if it holds water, few will argue that it was the most horribly destructive event in the history of our universe. Now, it counts as an ecological disaster only if there was a universe in exitance prior to the Big Bang that created ours, and only if that universe supported life. If all of those are true, then the big bang obliterated an infinitude of ecologies. Literally ALL of them. And if those things aren’t true, but the cyclical universe theory holds true, then the ensuing Big Crunch that will destroy OUR universe will be the biggest ecological disaster ever. And if THAT doesn’t happen, then Heat Death takes the title. The important thing is that at some point in the history of our universe, or at some point in the future, our environment and all others either did or will get wiped out, and it will have nothing to do with deep sea drilling. Take THAT, hippies. And so ends our little list for this week. Our apologies to the disasters that didn’t make the cut. Ice Age, Global Warming, the annual All-Texas Chili Cook Off? Try harder next time.